If you’re wondering, “What is included in a well stocked pantry list?” you’re in the right place! When it comes to saving money and living on one income, a well stocked pantry that allows you to cook simple meals at home is a must! These are the items that you will always find in my pantry. Of course, pantries vary based on what the people in the house like to eat, so keep that in mind! 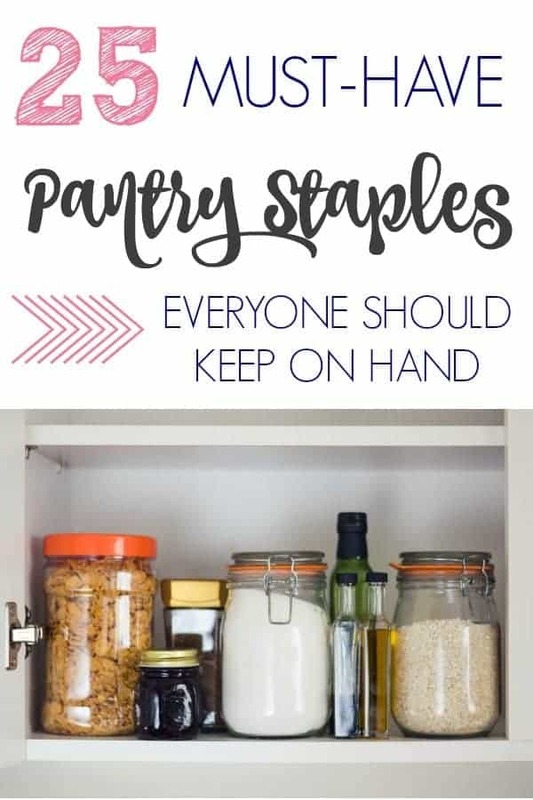 Before we jump into my pantry staples checklist, let me talk for just a minute about saving on those pantry staples. You could always go to the grocery store and stock up on those supplies, but how often have you found yourself in the grocery store and you actually forget to buy some of these things? Then you get home and realize you need it for your meal that night, but it slipped your mind. That’s where Amazon Prime Pantry comes in. With a prime membership, you can sign up for the additional Prime Pantry service. When you spend $40, you get free shipping and all of those pantry staples, snacks, and household items delivered straight to your house. No more unnecessary trips to the store where you’ll probably end up buying stuff that’s not on your list! So, in my pantry I always make sure to keep these items on hand. I can easily whip up a simple soup with these ingredients, plus some meat and veggies. I can make peanut butter oatmeal cookies, or an easy salad dressing. White vinegar is great for all sorts of purposes from cleaning to pickling veggies. I like to keep apple cider vinegar and red wine vinegar on hand for seasoning food. I cook with olive oil all the time. Enough said! If I need to fry something, I use coconut oil. I use this in everything. Soups, meat seasonings, everything! For coating meat to fry and making bread or biscuits. Great for thickening soups and gravies. So versatile. Desserts, lunches, breakfasts. My kids love noodles. Add a little butter and some seasonings and you have an easy side dish. Great for flavoring smoothies and making brownies and cookies. To sweeten things, of course. Perfect for cleaning and baking! Same as peanut butter. Amazing for breakfast, dessert, or grinding up for filling meatballs or patties. Salsa makes a great snack, and can be added to meat for a Mexican flair! We use paper towels for occasional cleaning and if I fry anything I use them to drain the grease. I love Mrs. Meyer’s dish soap and hand soap! With Prime Pantry, the prices are slightly cheaper than anywhere else I’ve found! I keep hand soap in our bathrooms. With a bunch of kids, it is necessary! A few years ago, I wrote all about how to inventory your pantry and freezer. I also created a HUGE master monthly grocery list that includes all of the items that I purchase most frequently. 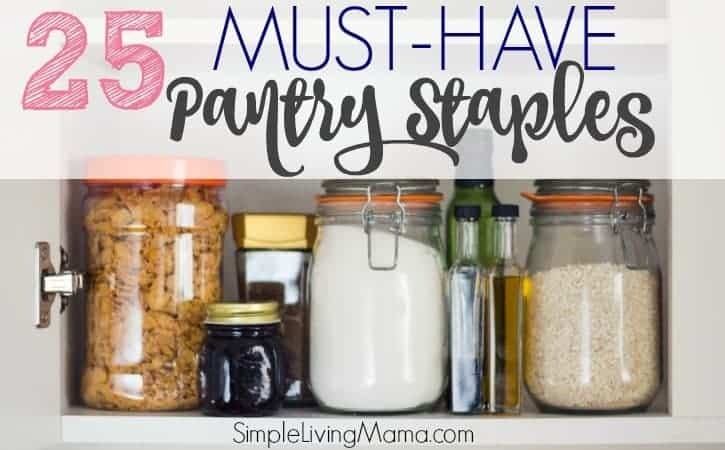 It’s great for keeping in your home management binder when you need to make a grocery list and you want to make sure you have a well stocked pantry.